Download "Synergy Spanish Solutions. 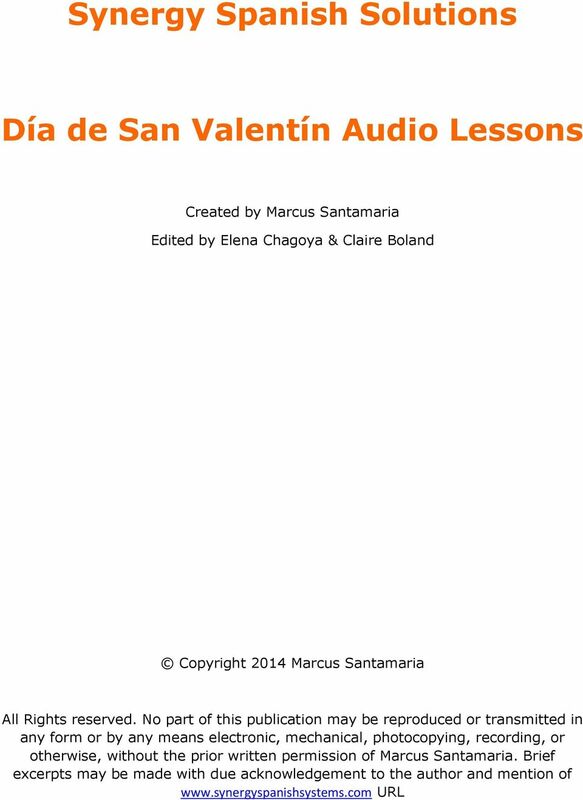 Día de San Valentín Audio Lessons"
2 Hola Amigos. 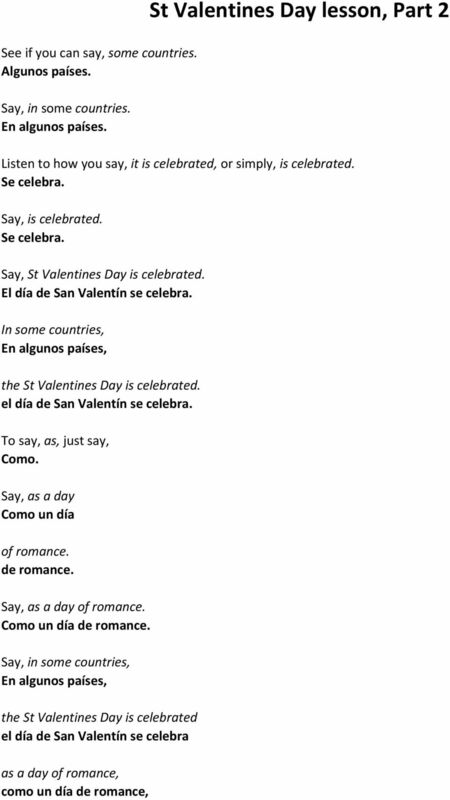 We ve got as special Valentines Day lesson for you here today, but before we get you speaking, have a listen to a little bit of Spanish. Don t worry if it sounds a little tricky. You ll soon understand everything. El día de San Valentín es una celebración tradicional en la que los amigos, enamorados, novios, o esposos expresan su amor o cariño mutuamente. Se celebra el catorce de febrero. En algunos países, se llama día de los enamorados y en otros, como día del amor y la amistad. 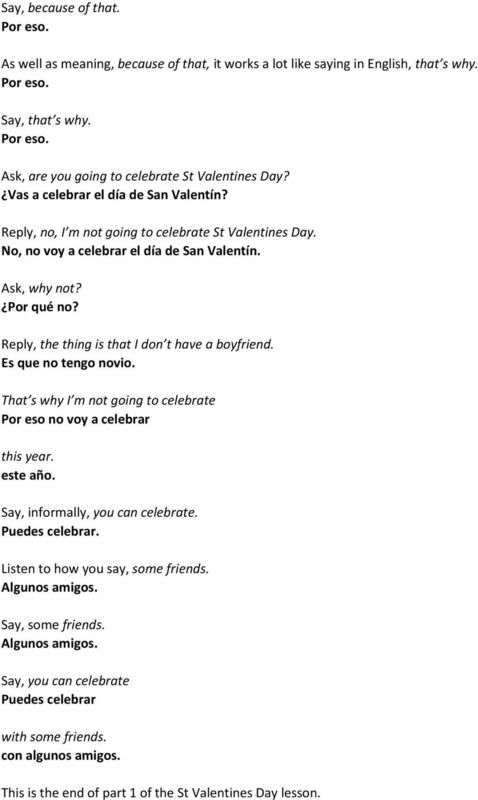 Listen to how you say, St Valentine, in Spanish. San Valentín. Say, St Valentine. San Valentín. See if you can say, St Valentines Day, by saying, the day of St Valentine. El día de San Valentín. I m going to assume that you ve studied my material and you re familiar with the synergy verbs, brick verbs, and mortar patterns from Synergy Spanish. But, if you haven t done that course, you ll still be able to do this lesson. Do you know how to say, formally, you are going to do? Va a hacer. To make that into informal Spanish, you just ad an s to the first verb. Vas a hacer. Say, informally, you re going to do. Vas a hacer. Ask, what are you going to do Qué vas a hacer on St Valentines day? en el día de San Valentín? Ask, what are you going to do on St Valentines day? Qué vas a hacer en el día de San Valentín? Are you going to go to a restaurant? Vas a ir a un restaurante? 3 Are you going to buy flowers? Vas a comprar flores? Are you going to celebrate St Valentines Day? Vas a celebrar el día de San Valentín? Reply, no, not this year. No, no este año. I m not going to celebrate St Valentines Day. No voy a celebrar el día de San Valentín. Ask, why not? Por qué no? Here s a useful Spanish expression that s a good way to start sentences. Es que. Literally it means, it is that, but it s just like saying, the thing is. Es que. Say, the thing is. Es que. 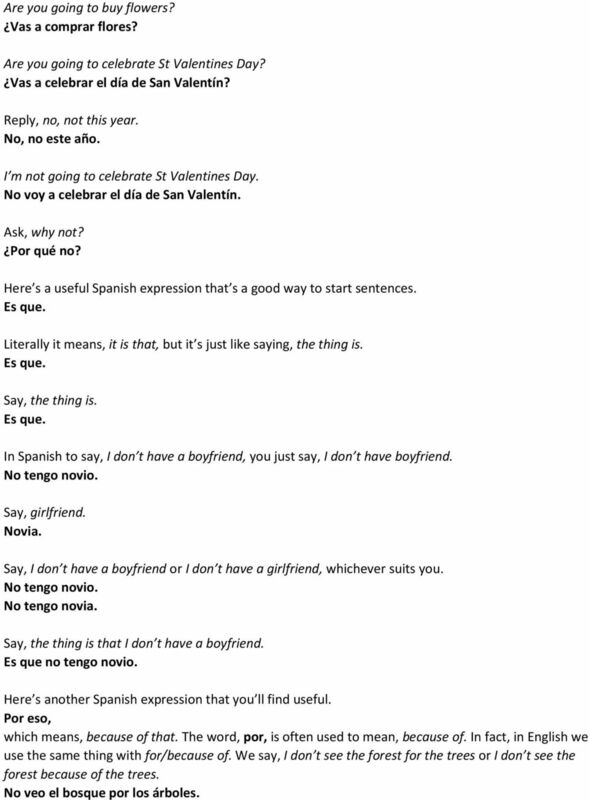 In Spanish to say, I don t have a boyfriend, you just say, I don t have boyfriend. No tengo novio. Say, girlfriend. Novia. Say, I don t have a boyfriend or I don t have a girlfriend, whichever suits you. No tengo novio. No tengo novia. Say, the thing is that I don t have a boyfriend. Es que no tengo novio. Here s another Spanish expression that you ll find useful. Por eso, which means, because of that. The word, por, is often used to mean, because of. In fact, in English we use the same thing with for/because of. We say, I don t see the forest for the trees or I don t see the forest because of the trees. No veo el bosque por los árboles. 4 Say, because of that. Por eso. As well as meaning, because of that, it works a lot like saying in English, that s why. Por eso. Say, that s why. Por eso. Ask, are you going to celebrate St Valentines Day? Vas a celebrar el día de San Valentín? Reply, no, I m not going to celebrate St Valentines Day. No, no voy a celebrar el día de San Valentín. Ask, why not? Por qué no? Reply, the thing is that I don t have a boyfriend. Es que no tengo novio. That s why I m not going to celebrate Por eso no voy a celebrar this year. este año. Say, informally, you can celebrate. Puedes celebrar. Listen to how you say, some friends. Algunos amigos. Say, some friends. Algunos amigos. Say, you can celebrate Puedes celebrar with some friends. con algunos amigos. This is the end of part 1 of the St Valentines Day lesson. 6 but, in other countries, pero en otros países, it is celebrated. se celebra. Say, it is also celebrated. También se celebra. Do you know how to say, friendship? Amistad. Say, a day of the friendship. Un día de la amistad. Say, it s also celebrated. También se celebra. Say, as a day of the romance. Como un día del romance. Say, in some countries, En algunos países, the St Valentines Day is celebrated el día de San Valentín se celebra as a day of romance, como un día del romance, but, in other countries, pero en otros países, it s also celebrated también se celebra as a day of the friendship. como un día de la amistad. Ask, when is it celebrated, Cuándo se celebra the St Valentines Day? el día de San Valentín? 7 Reply, it is celebrated Se celebra the fourteen of February. el catorce de febrero. Say, it is celebrated the fourteen of February. Se celebra el catorce de febrero. Ask, when is it celebrated, St Valentines Day? Cuándo se celebra el día de San Valentín? Reply, it is celebrated the fourteen of February. Se celebra el catorce de febrero. Do you know how to say, it is called? Se llama. It s the same structure as, it is celebrated. Se celebra. Say, it is called. Se llama. Ask, what is it called? Cómo se llama? Reply, in some countries En algunos países it is called the St Valentines Day, se llama el día de San Valentín, and in other countries y en otros países it is called se llama the day of the love el día del amor and the friendship. 8 y la amistad. Say, the day of the love and the friendship. El día del amor y la amistad. It s also called. También se llama. Listen to how you say, the lovers, in Spanish. Los enamorados. Say, the lovers. Los enamorados. Say, the day of the lovers. El día de los enamorados. Ask, when is it celebrated, St Valentines Day? Cuándo se celebra el día de San Valentín? Reply, it s celebrated the fourteen of February. Se celebra el catorce de febrero. Ask, what is it called in Spanish? Cómo se llama en español? Reply, in some countries En algunos países it is called the day of St Valentine, se llama el día de San Valentín, In some countries it s called St Valentines Day, En algunos países se llama el día de San Valentín, and in other countries, y en otros países, it is called se llama the day of the love and the friendship. el día de la amor y la amistad. 9 Say, it is also called the day of the lovers. También se llama el día de los enamorados. Well, we ve almost reached the end of the lesson. 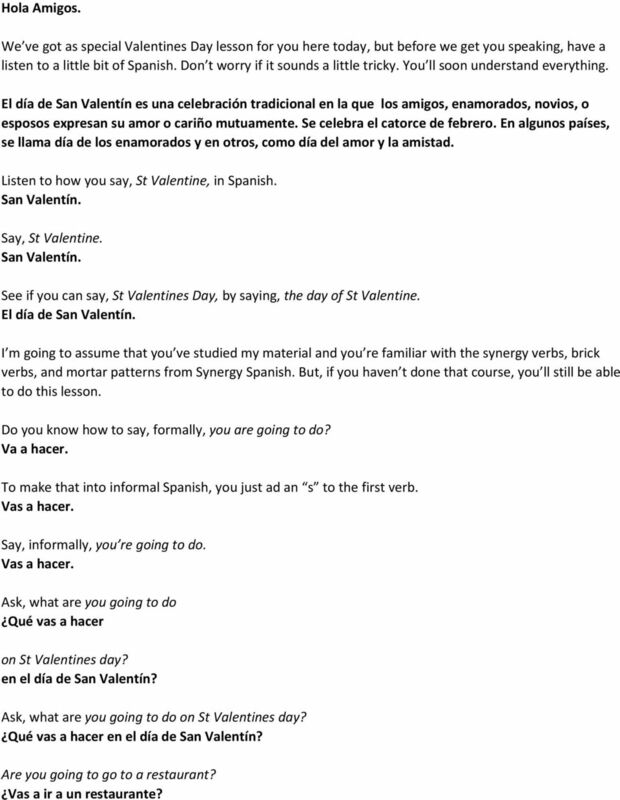 Before you ego, let Elena tell you a Little bit about St Valentines Day and see how well you understand the Spanish. El día de San Valentín es una celebración tradicional en la que los amigos, enamorados, novios, o esposos expresan su amor o cariño mutuamente. Se celebra el catorce de febrero. En algunos países, se llama día de los enamorados y en otros, como día del amor y la amistad. María: No. El gato nunca come en la cocina, siempre come en el pasillo. Synergy Spanish A 25-Day Course That Shows You How to Easily and Quickly Turn 138 Spanish Words into Effective Spanish Communication. Learning Spanish Like Crazy. Spoken Spanish Lección Uno. Listen to the following conversation. Male: Hola Hablas inglés? Female: Quién? Learning Spanish Like Crazy Spoken Spanish Lección Uno. Listen to the following conversation. Male: Hola Hablas inglés? Female: Quién? Male: Tú. Hablas tú inglés? Female: Sí, hablo un poquito de inglés. NO MÁS conversation starters are suitable for children of all ages. Simply select a card and start a conversation. Nombre I. Vocabulario y expresiones: página 229 Capítulo 7 REPASO PARA EL EXMEN Hello (on the phone) Who's calling? Of course! To feel like doing something To shave To brush your teeth Would you like? Español. Learn a language your way! Lesson #6 - Por el mismo dinero que la otra, me llevo dos! PDF - Beginner. www.cactuslanguagetraining. 3:45 - (son las) cuatro menos cuarto/ tres y cuarenta y cinco ENG: a quarter to four/ Three forty five. Capítulo 1 Lección 4. A pesar de todas las dificultades y problemas Dorothy era feliz. Despite all her troubles and problems, Dorothy was happy. H 7, Inglés 6 G Unidad 1 I need a break! Contenidos Comunicativos -Expresar preferencias. -Dar razones. -Expresar quejas. -Hablar del tiempo. -Hablar de viajes y vacaciones. Uso del Inglés -Why y because. There are four words in Spanish that mean the. Español. Learn a language your way! Lesson #6 - No tengo tiempo para ninguna otra cosa. PDF - Beginner Plus. www.cactuslanguagetraining.